“This is an opportunity to restore confidence and put right our deficiencies,” he said. Following consecutive league defeats to Jersey, London Scottish and Carnegie, Rotherham have dropped to seventh in the Championship table on 27 points. Pirates are ninth with 25 points, so Rotherham can’t afford to fail again when so few points separate the clubs outside the top four. Rotherham, meanwhile, have suffered another serious injury blow to a major player with confirmation that scrum half Andy Davies will be out for at least a month. Davies dislocated a thumb at Headingley and will be replaced by either Dan White or Luke Carter. Jones is not expected to make any significant changes elsewhere to the team, but it is thought that he may tinker with the back row. 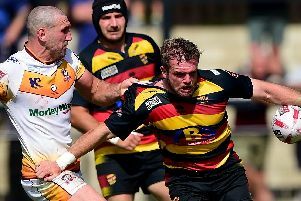 It is essential that Titans make the most of home advantage tomorrow, but it won’t be easy because they have lost their last three games at Clifton Lane. They also need experienced players, such as James McKinney, Michael Keating, Sean Scanlon in the backs and in the forwards, Barney Maddison, Robin Hislop and Tom Calladine to lead by example so the rot is stopped. Titans need to reproduce the outstanding performance they delivered at Penzance in September when they won 26-24. Rotherham (from): Scanlon, Keating, Rath,L.Hayes, Barker, J.Hayes, McKinney,White, Carter, Hislop, Cromie, C.Maddison, Preece, Thiede, Tampin,Salmon, Holmes, B.Maddison, Argyle, Oram, Birch, Calladine, Cree, Jones.